If your idea of Chinese is the fast food joint that delivers noodles in cartons, then you, my friend, have a lot to learn. Toronto has a colossal Chinese population, and a hub, also known as, Chinatown. Toronto’s Chinatown first appeared during the 1870s, the earliest record of the community is traced to Sam Ching, who owned a hand laundry business on Adelaide Street in 1878. The original Chinatown was centered near present-day Elizabeth and Hagerman Street, but the present downtown Chinatown is centered at Spadina Avenue and Dundas Street. Toronto’s Chinatown is one of the leading in North America. With the population changes of recent decades, it has come to reflect a diverse set of East Asian cultures through its shops and restaurants, including Chinese, Vietnamese, and Thai. The major Chinese malls in the area are Dragon City and Chinatown Centre. 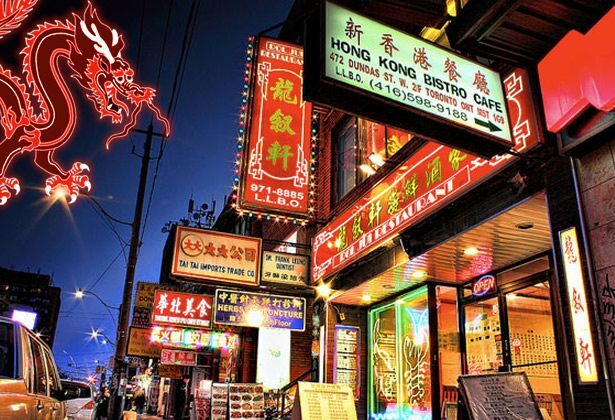 Historically, Toronto’s Chinatown has been characterized by immigrants and families from southern China and Hong Kong. Since the transfer of Hong Kong’s sovereignty to the People’s Republic of China in 1997, immigrants from mainland China have significantly surpassed those from Hong Kong. However, currently, Cantonese remains the chief language used by businesses and restaurants in Chinatown. The Chinese immigrant populace now contains diverse subgroups: while some Vietnamese Chinese, who normally arrived as underprivileged refugees, continue to reside in old Chinatown, others now live in suburban Mississauga; the wealthy Hong Kong Chinese now tend to settle in Markham and Richmond Hill. Among new immigrants, those who settle in the historic Chinatown tend to be Mainland Chinese. To the east of Spadina Avenue, numerous university students attending the University of Toronto, the Ontario College of Art and Design, and Ryerson University live in many of the small houses built as workers’ housing. Toronto serviced apartments are a larger and more comfortable alternative to those old homes. The area to the west has seen a surge in Latin American immigrants. The diversity brings a more multicultural flavour to the district, but may gradually reduce or eliminate its identity as Chinatown. For those who wish to immerse themselves in Chinese culture, without actually going to China, Toronto short term apartments are the right choice. There are many attractions that take place in Chinatown, such as the guided interactive tour called A Taste of the World. Many restaurants are available to serve up authentic Chinese cuisine like, Bright Pearl Seafood Restaurant, Kwangtung Dim Sum, or New Ho King Restaurant. Festivals also taking place in this neighbourhood are the Toronto Chinatown Festival and the Chinese New Year celebration. If you’re visiting, staying in Toronto furnished suites, or planning a trip, make your way over to Chinatown and see for yourself. Toronto accommodations can be made from anywhere by calling: 1-888-SVS-STAY (787-7829).